"INSIGHT Article - Cultural Challenge Series - #4: Services & Solutions Delivery Management by Tom Esposito"
The following article is one of a multi-part series on cultural challenges, utilizing The INSIGHT Group's 10 Elements under its Solutions / Services Business Model Architecture. The series' full introduction is reprinted below, but you can jump to this article's specific element #4 - Services & Solutions Delivery Management by clicking here. "Services & Solutions Delivery Management"
The intent of the INSIGHT articles on “Business Culture” is to help firms identify some of the most important behavioral/cultural differences between managing the Product Business Model vs. managing the “Services & Solutions Business Model and hopefully to assure a more successful management of both models in a single enterprise. One of the most important management elements of the Services & Solutions Business Model is your firm’s ability to deliver your capabilities in an exceptional manner; meeting all of the commitments made during the sales/deal making part of the engagement. (Refer to prior article on Element #3 “Deal Making”). 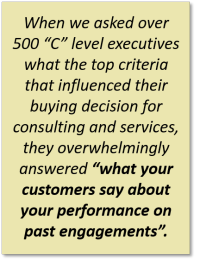 When we surveyed over 500 “C” level executives on what the top criteria that influenced their buying decision for consulting and services, they overwhelmingly answered “what your customers say about your performance on past engagements”. Most product firms have very strong processing for measuring customer satisfaction with their products but are usually not completely aware of the important differences in how services and solutions firms manage the delivery processes from project management through customer satisfaction management. This article will be focus on the End-of-Engagement (EOE) or Engagement Complete Process. This phase of the end-to-end Services Business Management Process terminates all activities on the engagement only after it has been assured that all contractual obligations have been met and the customer project executive is in complete agreement. The overall engagement is evaluated for effectiveness and identification of what can be learned to improve future engagements but also to identify follow-on business. This approach is very different from product-based customer satisfaction reviews which generally occur formally once a year. The EOE process is executed after each engagement or every six month for multi-year engagements. 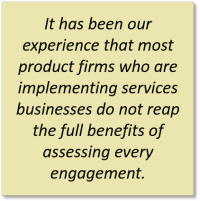 It has been our experience that most product firms who are implementing services businesses do not reap the full benefits of assessing every engagement. In this Engagement Complete Process, we again find an opportunity for the innovative use of 'voice of the customer' (VOC) which occurs toward the end of the engagement. Asking in a rigorous, disciplined fashion about how you are doing and what you need to change to win more of their business for each project is critical and unique to the services business. The constant listening, learning, and improving enables you to deliver even more value to your customer, to grow your business, and to stay on top of current challenges. It also gives you real time evaluation of your people enabling them to grow and improve. You get better and better at solving today’s problems and understanding the job the customer is trying to improve for tomorrow’s offerings. VOC at this stage helps you not only find the opportunities but to refine your offerings and upgrade your capabilities in order to maintain relevance and value to your customers. Next Element: #5: Skilled Resources Management. Tom Esposito is Chairman and Founder of The Insight Group. Prior to INSIGHT, Tom had a distinguished career at IBM with a broad range of responsibilities, including senior executive positions in organization and management systems, marketing, and services where he was Vice President of Global Consulting and Services and Chairman of the Services Executive Council. Tom is credited as one of the key architects of IBM’s Global Services business, which today is IBM’s largest & fastest growing business.